First of all, let me say, thanks to the mod author for creating such a cool and beautiful mod! I love this mod almost completely, and yet I have to sadly remove it from my game because the amount of vanilla light meshes that appear "on" aren't emitting any light. I suspect that all light models use the same mesh, and that's why all of them appear "on," regardless of if it is actually a light source. It's a real shame because if it weren't for that I would be absolutely in love with this mod. I will try to look into a solution, but I doubt I will have time to actually fix it. That being said, if any of you guys know any way to fix this, please let me know. Overall, this is an amazing mod, as it makes most of the lighting much better, but there is one massive drawback that I'm experiencing, to which I don't use this mod anymore, and that is the extreme amount of bloom (or fuzz, depending on how you put it) on certain lights, not all, but a select few. I would recommend adding an option to remove bloom, or have very little to where it's not really visible. It's very annoying in my opinion. If anyone is having problems with overly bright lights while using NAC + the NAC enhancer ENB, try disabling the ENB lens flare effect. Tweaking bloom didn't seem to do anything to fix it for me, but opening the enb in game menu and unticking EnableLens got rid of the issue entirely (you can also do the same thing by opening your enbseries.ini and changing it to Enablelens=false). Duuuude Thank you so much. That's like a night and day of a difference. Cuts the uneeded blurriness effect down by at least 50%. Now it's playable. Thanks a bunch man i didn't get the blurriness too much but the lens flare was too intense and that fixed it right up, would you by any chance know how to keep a little bit of lens flare just not how much it gives you? I'm using the mod next to the preset that includes and the lights looks like bright squares. What am I doing wrong? Can someone please post an elfx patch, or instructions. Is this mod safe to uninstall? Do I need to start a new save game? How do you properly install the Clean ENB or just install the bloom settings from Clean to use with another enb? I can't seem to get this and prc working together correctly. I don't think this mod is compatible with PRC, which is really sad. I've tried following the tutorial for 'square issue' (which sorta looks like the problem I'm having) but the enbbloom.fx window looks completely different than the one in the screenshot. I changed the variables in the window anyways to try and fix it but no dice. I then tried to modify enbbloom.fx in notepad++, the next thing to try in the tutorial, but I can't find the line that the tutorial wants me to edit. As for step 4, I don't want to get rid of PRC because I love it... so I'm not going to switch enbs and since I'm not an 'advanced enb user' I don't know how to 'hack' in the gaussian bloom. heartbroken. 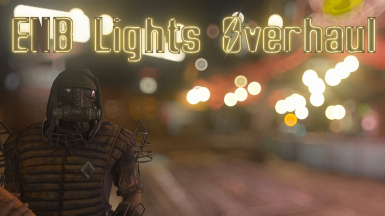 I enjoy shiny lights and PRC's lens effect would make this mod look really neat if it worked. You can see the light from bright objects bounce around in the virtual lens like you were looking through a HQ camera. It's a really neat effect. This was made to work with NAC Enhancer ENB, I know it's been more than a year but it absolutely should. At least now. Do I add the Clean enb file to my current enb? Or is it a total enb preset? Sorry if this is a dumb question. This mod along with Enhance Lights FX seem to work if you freshly install them, if Enhanced lights is loaded first. HOWEVER, if for any reason i uninstall a mod that's say 20 esp's down, and it's just a pistol, this mod has a bug where it's purple/pink caged lights. I've tried every possible way to fix this, and it only fixes itself SOMETIMES if i mess with where the esp is. And fussing around with uninstalling and reinstalling this mod in particular causes issues with the Pip-boy flashlight. Very odd. Any reason or explanation? You need to make a patch for them to both work correctly. Just loading it after each other doesn't make it comaptible. Especially when they both edit the same things in the same cells. Naw, i don't make patches or mess around with FO4EDIT. My knowledge of the tool along with CK are limited so chances are i wouldn't know what im doing. My question wasn't so much "why don't these 2 work together", it's more like from my testing they DO work together but any slight change in the ESP list causes this mod to suddenly not work. "but how will it work with mods like Beantown Interiors, or Lighting and FX enhanced, etc. needs to be better tested, per mod basis. " - It doesn't help i've seen comments mention the purple/pink lights and no answer has been given. I don't think this author is updating it or checking it. But they don't work together. They edit a lot of the same things when you open them up in FO4EDIT. That is why you get the purple and pink lights. Cause ELFX alone there is no problems, but when adding this to my load order without a patch, i get the purple and pink lights. I am using this mod along with NAC and PRC. Initially everything worked well but I soon encountered the infinite black loading screen bug with only the logo at the lower right corner, this happens whenever I enter/leave buildings and the loading screen only ends if I alt tab out and back into the game. After some testing I singled out this mod to be the cause. After disabling this mod loading screens are still black but lasts anywhere from 5-15 seconds, this is acceptable. I have load accelerator mod as well. It's a shame because I really dig how this mod looks, anyone else encountered this issue and was able to fix it? I take this back. Not caused by this mod but somehow after I removed https://www.nexusmods.com/fallout4/mods/28143, loading screens are under 5 seconds consistently now.